Thick neck – those patients with a neck circumference of 17 inches are at a much higher risk for sleep apnea than other patients. Obesity – patients who are well above a healthy weight are much more likely to experience obstructive sleep apnea. 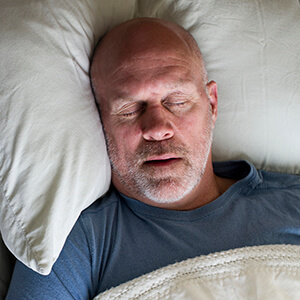 Masculinity – men are at a much higher risk for sleep apnea than women, and should be checked more frequently for warning signs of apnea. We are seeing a growing number of female sleep apnea patients over 50. If you’ve been diagnosed with sleep apnea or you’re concerned you or a family member may be suffering from sleep apnea, we invite you to contact our team. At Vista Dental Care, we offer customized, comfortable oral appliance therapy to help patients suffering from sleep apnea to breathe deeply and sleep soundly. Oral appliance therapy shifts the jaw forward keeping the airway clear during sleep. This prevents snoring and sleep apnea incidents and ensures patients remain soundly asleep throughout the night whether at home or away. We are happy to provide sleep apnea consultations for any patients. Simply contact our team to find out more today.